WAIST HIGH: Reason Number 6,877 Waist High Loves Portland Oregon! Reason Number 6,877 Waist High Loves Portland Oregon! "It all began with a man named Scott Wayne Indiana. 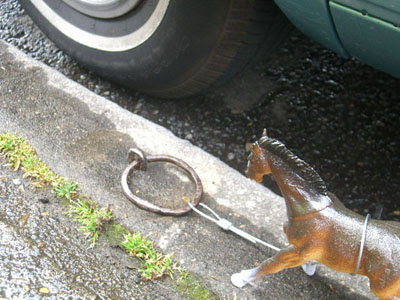 He knew about the horse rings in many Portland sidewalks and thought it was a shame that we don't tie our horses to them anymore. Scott decided to change that and tied his first pony to a horse ring in the fall of 2005 in the revitalized Pearl District in Northwest Portland. After a few months, he decided to expand the horse project and get some help. Now these horses are showing up all over Portland. You can find them in most parts of Portland now." Please check out The Horse Project, but for God's sake please do not decide you want to move here. We're full.